Ideas is a series talking about the communities, people, and ideas surrounding the music and culture industries. I love Ontario’s small towns; I grew up in one, a tiny village called Keene that, even today, is home to only about 500 people. I’ve got no illusions about small-town life – it can be stifling and tortuous, especially for a young woman with unusual tastes who doesn’t fit in. But there’s lots to be said for their sometimes-fading charms; heritage downtowns, odd little shops, idiosyncratic bits of architecture. They’re monuments to a time when our country was more sparsely populated but prosperous, when travel was slower, and when even a small town was a world to the people that lived there. In my experience, they’re often cut off from local or regional culture – musicians don’t tour there, community networks built on church attendance have broken down, and culture is mostly received via radio, tv, and the Internet. There’s no one to inspire a young artist; chances are, there’s no one who’s even met a professional, full-time musician, except maybe in an autograph line. But in each of them, there’s a legion, an old town hall, or even an opera house, with a built-in stage and a venerable upright piano that’s seen happier days. In my hometown, the Legion has a stage. 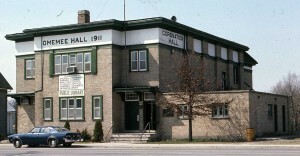 In Omemee,1 they’ve got the unlovely but (to me) architecturally fascinating Coronation Hall, built in 1911 to honour the ascension of the current Queen’s father, George V. Often built around that period, these halls would have played host to the travelling Vaudeville shows and itinerant musicians2, and often have the lovely acoustics of theatres built before electric amplification was widely available. 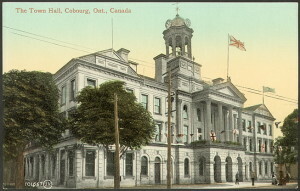 If you’re travelling anywhere in Ontario, these towns are usually about 45 minutes apart by car – probably a solid 6-8 hour’s travel in the days before paved highways and motorcars. Unless there’s a lovely lake or other tourist draw, they can be sleepy, unchanging places, where you can nab a locally-famous buttertart3 and a bag of squeaky-fresh cheese curd4 but not a grande frappuccino.5 And there’s usually no live music. Maybe there’s a local bar with a weekly cover band or karaoke, but it’s a rare small-town that has even that much music. And as great as they can be, cable and the internet are a poor substitute for hearing the beautifully-crafted performances of professional musicians, played live right in front of you. I’ve seen the positive effect that bringing live, original, and high-quality music to a rural area can have – the community that’s sprung up around the Shelter Valley Folk Festival is a testament to it. And I know that, as a young girl, meeting a professional working musician and seeing them play would’ve been inspiring beyond words. What I’d love to do is to bring a little of the great music that I get to hear live every day ’round to these church halls and Legions across Ontario, and connect with these communities. Bring professional musicians and sound techs and gear, do daytime workshops in the local schools or libraries. Hold an evening performance, and see if the UCW 6 can drum up a nice bake sale with coffee and tea, or maybe a chili supper. Start at 7pm, make it Pay What You Can,7 and connect with some local musicians to do ‘tweeners or sit in on some songs. Maybe – if the money was there – you could record the performances, broadcast them or put them up online, see if you can’t connect these communities or link them in to the Home Routes network. The idea isn’t to bring culture to the uncultured, but to celebrate these small towns, engage them in the national conversation, reconnect these communities with the artists that crisscross our country, and – ideally – inspire the growth of local music and culture. Maybe we’ve got another couple of David Franceys hidden away in our small towns; maybe we’d inspire a Grandma to sing to her grandchildren or join a local choir. Maybe we’d get a shy highschooler up on stage and give her the platform to find her voice. Maybe it would inspire local organizers to create their own music festival, a regional celebration and draw for tourists. This is an idea that I’ve mulled over many times – we were looking to do a northern Ontario legion tour. I lived in Beaverton for many years and always marveled at the old Town Hall building (similar to the Omemee Coronation Hall) and thought it would be a great thing to bring music back to the famed stages. I’d love to help out if you decide to give it a go! Hey, I LOVE this idea. I’ve put on small concerts in little towns (including the Hick-Town I grew up in, Petrolia, Ontario!) I’ve had some super successful nights as well. I usually try and find a local artist or two (young kids are the best to open the show) who can kind of help you get the word out to the locals. Small towns are very supportive of “their own” and sometimes a bit resistant to try out the “big city music with the bipping and the bopping'” but overall it’s totally a worthwhile endeavour and you meet some amazing characters!